* There is a second species in the picture if you look carefully. Growing in a little clump underneath an Oak yesterday were these fb's.It seemed logical that they were Wood Mushrooms, but Roger Phillips has forty different Agaricus in the UK, so required keying out properly. 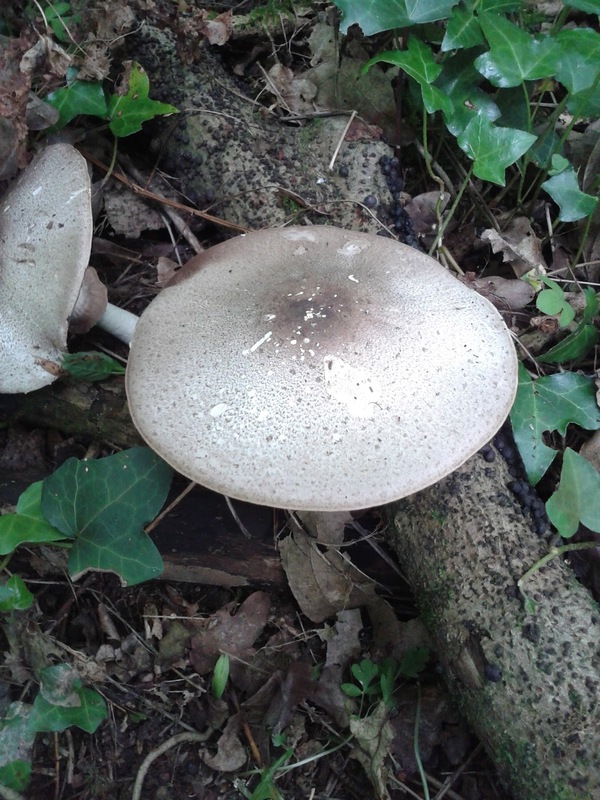 I was always given to understand that if an Agaricus bruised yellow, then it was best not to try eating it. However one of the key indicators for this species is that it "strongly discolours yellow", nevertheless it is considered good eating! I was also surprised that when I looked it up on FRDBI there was only one previous VC record for it - Pembrey 1994 (I'm guessing it's one of yours Philip!). The books say "common in Southern England". It's a new record for my little wood. The second (less obvious) fungus is on the fallen branch to the right of the fb. If I'm right and the branch is a piece of Beech, then they are Hypoxylon fragiforme, the Beech Woodwart. PS Found Pleurotus ostreatus in NBGW on Friday. Tony and I have discussed this sp as I make the greyish-black cap colour more like A moelleri. Many other features (eg spore size) are very similar with both sp. A chemical test (Schaffer's) woud help but the chemicals are dangerous so hard to get! If I think I find A moelleri, I break the stipe base which turns an intense yellow immediately ---- the flesh of A silvicola is a paler yellow. The spelling of 'silvicola' may be 'sylvicola' in several books.